Everyone knows what a Mountain Bike looks like, smaller wheels than a road bike, knobbly tyres, spiky pedals, a big saddle and suspension? Well, that might have been true once, but now Mountain Biking has developed and diversified in a tightly focused range of disciplines, each with their own specific requirements and dedicated bikes. Sure you can ride loads of different tracks and trails on the same bike with no trouble, but here's the 10,000 foot view of the current state of cycling. Before we look at the different riding disciplines let's look at the what makes the bikes different. Broadly speaking there are three different bike categories. Fully rigid- with no suspension, Hardtail- which has front suspension and Full Suspension- which has both front and rear suspension. Once you've thought of those then you can break the suspension bikes down based on how much suspension travel they have, Short Travel- sub 100mm, XC bikes and light Trail bikes. 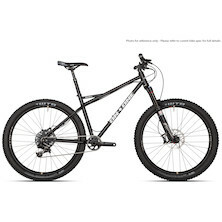 Mid travel bikes- 100mm-160mm, this covers Trail bikes, All-Mountain bikes and some Enduro bikes. 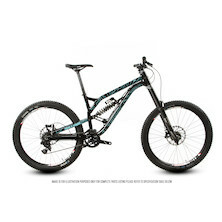 Long travel bikes- 160mm+, this covers most Enduro bikes, Downhill bikes and Freeride bikes. So, that's the bikes, broadly speaking, totally ignoring geometry and componentry choice, but we'll touch on these as we look at each riding discipline. Fully-rigid though more usually short travel front suspension bikes with a smattering of short travel full-suspension bikes. carbon frames, aggressive geometry with short front ends, 80-100mm of travel, steep seat angles, narrow bars, 1X drivetrains, 140/160mm disc brakes and clipless pedals. Wheels are almost exclusively 29er these days and tyre size with be in 1.5"-2.25" range. Tyre tread will typically be light with widely spaced, small edge tread and very small tread centre blocks- unless it's a mudfest. XC bikes are meant for riding as fast as possible over moderately rough terrain. The further away you get from pure XC race bikes the longer the travel options and the slacker the geometry becomes. A good XC race bike is going to weigh in below the mid 20lbs, but you're going to pay for that weight reduction through the nose. If you're not looking for a pure XC race bike but want a bike for long rides over typical XC geography, fireroads, twisty singletrack, modest descents and steep technical climbs then an XC bike is the logical choice. Our XC offering is the Maccatuskil, a full-carbon hardtail designed for a 100mm fork and 1X drivetrains. It's a light weight rocket ship that simply flies and soaks up anything you'd expect to tackle on any World Cup XC course. If you want something a little more forgiving then it's time for the next category. Trail Bikes come in a huge variety of styles and frame materials. Choose from Steel, titanium, aluminium and carbon or even mixtures of the above. Typically hardtails or short to mid-travel full-suspension bikes expect to see anything from 100-140mm of front and rear suspension and wheels are likely to be either 27.5" / 650b or 29ers. Larger wheeled bikes will be more suited to less technical terrain while smaller wheeled bikes will typically be targeting the more aggressive rider and trails. Trail Bikes are our most popular sellers at On-One, we have carbon, aluminium, and titanium, hardtail and full-suspension bikes that cover the range from beginner to dedicated trail smasher. If you want a simple steel hardtail with great pedigree that has proven capable of tackling any terrain look at our 4650b bike builds. If titanium, lights your candle then our new Ti 45650b and Ti29er bikes are perfect trail slayers. The Titus Fireline is a time honoured 29er built for fast trail riding and designed to tackle technical trails with ease. If you require a bike with a bit more bounce then the new Titus El Viajero Trail is our latest full suspension offering and offers 140/130mm of trail gobbling full suspension packaged with confidence inspiring geometry to help you push the limits of your riding. Move on up to the next riding MTB riding category and you are looking at bikes capable of riding any track or trail, winch them up any climb and thrash them down the descents and through the bends, twists and berms. All-Mountain bikes are just that, bikes built for riding the full mountain, all the way up, over the top and then back down again. Usually AM bikes are 27.5"/650b wheeled bikes, they're a little more nimble through twisty tracks and easier to finesse on the descents. You trade a little bit of rolling speed on flat ground for cornering grip and braking traction. Supremely confident bikes with slacker front geometry for more predictable handling. Expect to find 140mm-160mm of suspension, tyre widths around 2.2-.23", wider handlebars for easier steering and dropper seatposts that allow you to switch from climbing to attack stance at the flick of a switch. Our Codeine 27.5" perfectly typifies the breed, light, capable and easy to ride. The new Titus El Viajero Gravity Trail builds on the strengths of its shorter front travel sibling offer more plush so that you can push that little bit harder and ride the whole mountain. Sitting in between the All-Mountain bikes and the Downhill category is the DeeDar. A steel hardtail with Enduro bike geometry, a slack headtube, short back end, roomy cockpit and built for a 140-160mm fork, pick your poison and destroy the trails. The DeeDar is for riders who commit to the trail and want to feel rock, leaf, and twig. If you want to show the weekenders how your local trails should be ridden, do it aboard the DeeDar. Freeride isn't much of a thing anymore. Throwing yourself of huge cliffs used to be surprisingly popular- sanity has prevailed these days. Of course Downhill is perennially popular and riders get together to race and have fun on some of the steepest and most technically demanding trails that you can imagine. It's not for the faint hearted. Downhill bikes are built tough, expect a minimum of 180mm front suspension and 180-200mm at the rear. Large disc brake rotors 180mm+ will bring you to a stop quickly while you'll be rolling on 650b/ 27.5" wheels with gnarly tyres with directional and front and rear specific tread patterns. DH bike look like MX bikes without the engine and travel just about as fast. They are designed to be ridden to the top of the hills, they're designed for uplift days, and season passes on the chair lifts once all the snow has gone. Our homegrown Downhill hero is the On-One S36, kitted out with SRAM's GX DH 1X groupset, an MRP chain device, Rockshox suspension front and rear and a burly aluminium framed designed and tested in Sheffield's own notorious S36 postcode, home of the best tracks and trails in the whole of the Peak District. If you want a homegrown Downhill bike, built for British conditions and tested and raced on the UK's best known DH courses the S36 is the one to ride.